This article is currently undergoing a major expansion or revamping by FioFioFio. However, you are free to help in the construction of this page by improving it—use the talk page to do so. Please review the edit history if you would like to see whether the page is still being worked on. If the editor who placed this notice has not made any changes in a while, please contact the editor or, if they're inactive, remove this template. 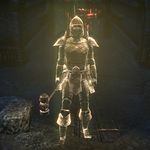 Undead refers to creatures or NPCs that are affected by Fighters Guild abilities. This can include reanimated skeletons, spirits, vampires, mummies, and zombies. For more information refer to the various pages below. 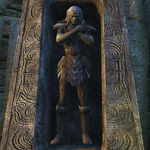 Draugr are Nordic undead most often found in the ancient tombs of Skyrim. 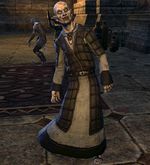 Many Dragon Priests encountered in the game are also Draugr. Mummies are an uncommon type of undead, appearing as a person covered in rotting bandages. They also have completely white eyes. 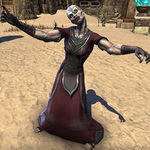 They are often resurrected Redguards or Ayleids (although a few mummies of other races exist) and most often are found in the Alik'r Desert or Shadowfen. 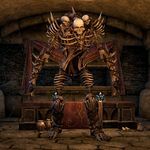 Skeletons are a common type of undead found in dungeons and crypts throughout Tamriel. Spirits are spectral versions of dead NPCs. 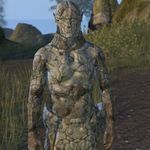 They can be found throughout Tamriel. 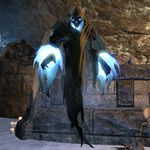 In-game, they may be referred to as "ghosts", "spirits", or "souls", but the term is used here to describe NPCs that appear as an apparition and are otherwise dead. 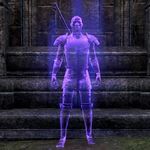 For other types of spectral NPCs, see Spectral NPCs. Not to be confused with the Ghost creature type (see below). Vampires are NPCs afflicted with Vampirism. The disease causes them to physically change, giving them pale skin and glowing eyes. One commonly found type of Vampire is Bloodfiends. They are feral vampires, and certain ones can infect the player with Vampirism. 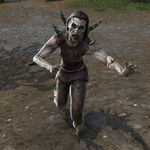 Bloodthorn Zombies: zombies being raised by the Bloodthorn Cult in Betnikh and Glenumbra. These zombies have a distinct appearance because they have thorny vines growing out of their backs. Plague Husks: victims of the Llodos Plague that have transformed into zombies rather than just dying. They are found in the Redolent Loam area of Deshaan. 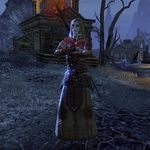 Ra-Netu: a uniquely Redguard form of undead, raised by necromancers. 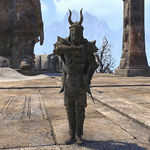 They are commonly found in Alik'r Desert. 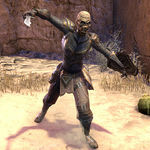 Anka-Ra were once a warrior band of the Ra Gada, who swore an oath of eternal loyalty to their leader, Emperor Tarish-Zi. When Tarish-Zi was pulled forward in time to aid The Warrior, the Anka-Ra were resurrected to continue fulfilling that oath. 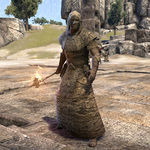 Appearance-wise, most Anka-Ra have stone skin, looking almost like moving statues. A few were resurrected as Skeletons and Liches, however. Notably, Emperor Tarish-Zi and Titus Valerius, having been pulled forward through time, are living and not undead. 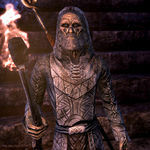 Hollow are stone constructs with an Altmer appearance that have been created/resurrected by the Wilderking. They are bound to protect different parts of Valenwood, on orders of the Wilderking. Nedic undead are undead versions of Nedes. 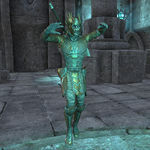 They are identical in appearance to Draugr or Dragon Priests, but as those are Nordic types of undead, that term does not apply. Bone Colossi are large aggressive undead creatures made from bones. As they are considered elite enemies, Bone Colossi are immune to all forms of crowd control effects. The bone colossus summons three to four Risen Dead to attack the player. The Risen Dead swipe at the player doing minor physical damage. After a while the Risen Dead explode if not killed, doing moderate physical damage around themselves as indicated by a red circle. The bone colossus stomps its foot doing moderate physical damage in a cone in front of it. Ghosts are apparitions of the deceased that are often found haunting tombs and graveyards. Not to be confused with spirits (see above), they assume a simpler, more generic form. They are considered flying creatures, and thus roots and snares will not work on them. Ghosts are weak to fire, and using fire based attacks on them may stun them briefly. A short ranged spell that does moderate frost damage and slows the player down. The spell can be interrupted to set the ghost off-balance, but cannot be avoided. The ghost winds up and releases an apparition in the direction it is facing. Touching the apparition will do moderate frost damage, as well as fear the player, causing them to run around randomly for a few seconds. This spell can be interrupted to set the ghost off balance, or simply avoided. Liches are aggressive undead creatures which attack using powerful spells. As they are considered elite enemies, Liches are immune to all forms of crowd control effects. A basic ranged attack that does minor magical damage, and can be blocked or dodged to reduce damage. A rune that is cast on the ground, indicated by a red circle. Standing in it will snare the player and do moderate magical damage over time to him or her. Stay out of the red circle to avoid this. 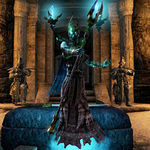 The lich will summon three to five lich crystals from the ground around it, as indicated by white cracks on the ground. Standing near the crystals as indicated by the red circles will do moderate magical damage over time to the player. This attack is always followed by Soul Rupture. Stay at range when this spell is cast to avoid the lich crystals. After a short time, the crystals explode, dealing moderate magical damage to all players within the red circle. Getting hit by the exploding crystals will cause the player to be lifted above ground briefly; the player can break free from this. Mournful Aegises are suits of armor animated by powerful Yokudan necromancy. They are similar in appearance to Air Atronachs. A heavy melee attack that does moderate physical damage. This attack can be blocked to set the aegis off-balance. The aegis spins around, doing moderate physical damage over time as indicated by a red circle. 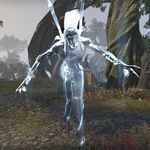 Wraiths are ghost-like undead monsters who attack using frost magic. This page was last modified on 28 September 2018, at 15:47.